Windows 10 launch day was always going to be a day to remember and now even the doom mongers can celebrate with a start menu issue to savour. First reported by The Register, the Windows 10 Start menu issue causes those users with more than 512 application shortcuts to suffer from missing entries with a coder seemingly thinking that 512 would be more than enough space. "I had a little over 500 apps listed and after a secure reboot all my start menu links were gone and they're missing now from all apps, too. There is no way to get Windows to recognise them again. Very annoying bug. I brought down the number under 500 by de-installing some stuff, but it still doesn't work," complained one user. 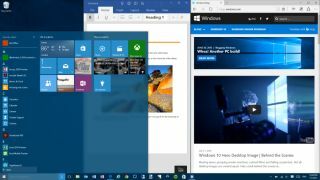 Using a third party Start menu program reportedly works around this issue and Microsoft is reportedly working on a fix to address it.